The Unitarian Universalist Church of Winnipeg celebrated its 125th Anniversary in 2016 and has been active in a variety of Winnipeg locations through the years. 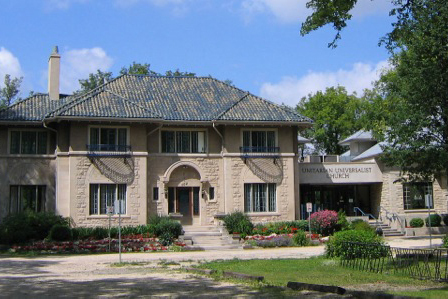 Now located at 603 Wellington Crescent, the church was originally built as the home of the local Managing Director of the John Deere Plow Company. The architects were Ross and Macfarlane, a Montreal firm that also designed the Hotel Fort Garry. The ornate fireplace in the living room and the mahogany wood staircase in the central hallway are two of the most distinguishing features of this home. In the late 1920’s, it was sold to W.P. Riley and then again in 1955 to Joseph Harris of Canada Packers. The newer sanctuary adjoins the house where the once stately carriage building was previously located. Designed by Prairie Architects, the new sanctuary opened in 2001 after much work and sweat equity by members. All are welcome to join us for church service on Sunday at 10:25am. Guided tours will run throughout the day, lasting 25 minutes.